Please email a resume or work history. Please include what Roll/Position you are interested in. ​Please provide your contact information. We seek out people who are honest and motivated. We want to build our teams so that they are strong, supportive and build to last. We offer living wages and higher. You work hard and we compensate you for it! We make monthly schedules so that there can be a happy balance between work and home life. We can work with you to find time for school/activities, for full time and part time Team Members. ​free t-shirt and hat on your first day, plus opportunity to win more! Our Mission is: WE SHARE. WE TEACH. WE LEARN We want our Team Member to grow with us, to learn more and show others. A sense of pride can go a long way! all persons looking to join our team must have knowledge of clean meat, animal welfare, different farming certifications. we will teach you the details and train on on our standard but you must come to us knowing that these choices are options for everyone. you must also have minimum 1-2 years experience in food service. CURRENTLY LOOKING FOR. At Cedar Street Location. RESPONSIBILITIES: This role is responsible for following/helping with all operations of the retail shop/dining room AKA The Shop/FOH. They are responsible for the slicing, packaging, labeling, packing, displaying and selling of all products. They are responsible for excellent customer service and interactions and all things related to that: wrapping, pricing, ringing out, customer flow, dining, serving, clearing, hosting etc. Must communicate all orders and needs via verbal and by filling out proper documentation to all necessary parties. Must maintain the safety, cleanliness and maintenance of the Shop/FOH and notify/bringing any and all problems/concerns/repairs to ownership. Responsible for all side work and daily duties that are listed and assigned. Responsible for checking all food orders before removing from window and delivery to customer within our standards. Always giving customers proper customer service when behind and in front of the cases. Clearing tables and helping customers will all needs. Answering the phone, taking messages, etc. Attendants follow mangers lead and are always guided by Rooster Street Butcher’s Mission, Vision and Values. 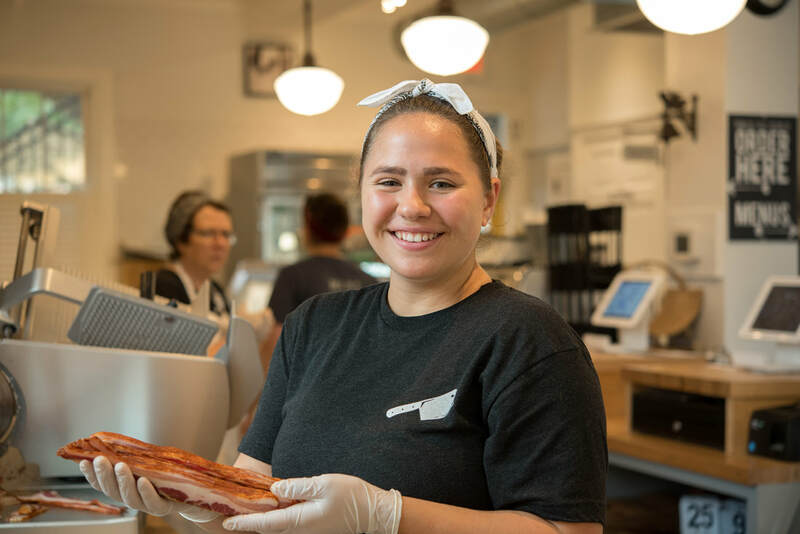 RESPONSIBILITIES: Cooks at Rooster Street Butcher are responsible for food preparation specific to our standards and recipes, writing and managing daily prep list. Properly handling and storing foods. Having station set up and ready on time. Following, monthly calendar with specials. Cooking food to our standards and within our 8-10 min ticket times. Cleaning of stations and of the entire kitchen area. Working with production room and other team members, to know rotation of products and clearly communicating. Season food accordingly. General/basic inventory of all items used. Assist other cooks. CURRENTLY LOOKING FOR. AT the wilbur LOCATION. RESPONSIBILITIES: ​ Cooks at Rooster Street Butcher are responsible for food preparation specific to our standards and recipes, writing and managing daily prep list. Properly handling and storing foods. Having station set up and ready on time. Following monthly calendar with specials. Cooking food to our standards and within our 5-8 min ticket times. Cleaning of stations and of the entire kitchen area. Working with Cedar Street location and other team members, to know rotation of products and clearly communicating. Season food accordingly. General/basic inventory of all items used. Lead cook at the Wilbur works directly with the Cedar Street Kitchen manager to coordinate all deliveries, inventory needs, and product rotation. Assist other Team Members. This position does require team member to interact with and communicate with customers face to face. CURRENTLY LOOKING FOR. LANC CENTRAL MARKET LOCATION. RESPONSIBILITIES: The market helper is responsible for daily operations at the market stand. They are responsible for excellent customer and all things related to that. The market helper must communicate all orders and needs via verbal/text and by filling out proper documentation to the Production Manager and FOH Manager at Cedar Street location; to make sure all products needed, and product transfers are being accounted/documented for. The market helper must maintain the safety, cleanliness and maintenance of the market stand bringing any and all problems/concerns/repairs to managers/ownership. The market helper is responsible for daily openings, working and selling of products and closing the booth daily. The market helper is responsible for the money and iPad at market and must make sure it gets deposited at the end of each market day and/or stored safely in booth.